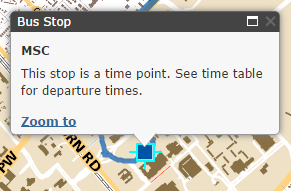 I cannot see leave times for my route! Where did they go? Menu: The Menu icon appears on mobile phones, and other small screens. Clicking or tapping on the menu icon will display the Route Selector, Date Selector, High Contrast button, and Bus Refresh button. Aggie Spirit logo: Clicking or tapping on the Aggie Spirit logo will take you to the default Bus Routes map, which displays all regular routes. 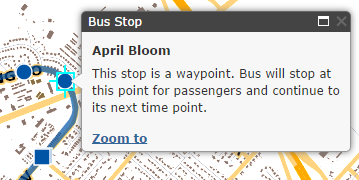 Bus Routes: Clicking or tapping on the Bus Routes icon toggles displaying the list of available routes. Routes are grouped into On Campus, and Off Campus. During football season a Game Day section will also appear. Time Table: Clicking or tapping on the Time Table icon toggles displaying of the time table for the route. A black time table icon indicates that there is a time table available. A grey time table icon indicates that there is no time table available. Announcements: Clicking or tapping on the Announcements icon toggles the list of announcements. Announcements in the list come from the Service Schedule, Transit Announcements, and Code Maroon alerts. This is information that Transportation Services has decided is important for our customers to know in a timely manner. When announcements are available, the announcements icon will change from grey to black. High Contrast: Clicking or tapping on the High Contrast icon toggles high contrast mode. Selecting High Contrast mode changes the color scheme from the standard route color to Maroon & White. When High Contrast mode is selected, the icon changes from grey to black. This setting is persistent across routes and sessions, meaning that if you select High Contrast mode and then select a different route, the route will be displayed in high contrast. Also, if you select High Contrast mode, close the browser, then return to the bus routes site later, High Contrast mode will still be enabled. This functionality is accomplished through HTML5 localStorage settings. If your browser does not support this functionality, or if this fuctionality is somehow disabled (private viewing mode on Safari, for example), High Contrast mode will have to be re-enabled each time the selected route is changed. Bus Position Refresh Clicking or tapping Bus Position Refresh toggles the countdown on and off. When the Bus Position Refresh is on, the icon is black, and the countdown number is white. When the countdown reaches 0, the bus position markers are updated to the latest position reported by each bus. Click or tap the Time Table icon to drop the table of leave times down. Time tables default to hidden when the site is viewed on a device with a small screen, like a mobile phone. If you are using a device with a larger screen, like a tablet, laptop, or desktop, the table of leave times will display automatically when you select a route. 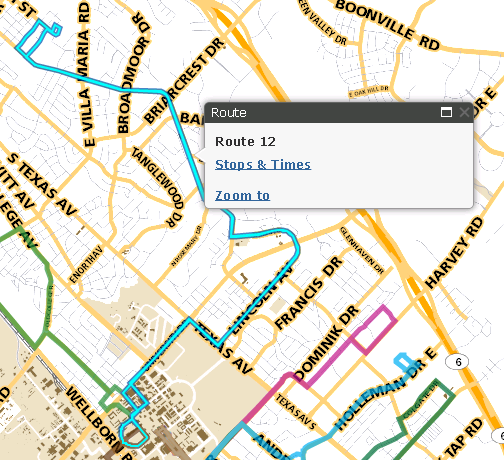 Tap or click on a route line to get more information about the route. Tap or click on a stop to get more information about the stop. Square markers indicate time point stops where a bus must stop and wait until the scheduled leave time. Round markers indicate regular stops where the bus will stop if passengers are waiting, or a rider has requested the bus to stop so that they can disembark. Tap or click on a bus marker to see the route that the bus is on, how full it is, the name of the next stop, and the estimated arrival time at that stop.